Step 1 Place the nuts in a bowl and cover with 2 inches of water. Cover with plastic wrap and refrigerate to soak at least one night, preferably two. Step 2 Drain the nuts and rinse under cold water. Place the nuts in a high-speed blender (this will need to be done in a couple of batches) and add enough water to cover by an inch. Purée until completely smooth. Step 3To make nut milk, pass the nuts and liquid through a nut milk bag or cheesecloth-lined fine mesh strainer. You can squeeze the bag or work with a spatula to make sure you get as much of the liquid as you can. The final "milk" should have the smooth consistency of whole dairy milk; if desired, add water to thin. This makes about 5 cups nut milk (consistency will depend on the type of nut and amount of water added while blending, and can vary from just over 4 cups to around 8 cups or more, depending on desired consistency). Step 4To make nut cream, after blending the nuts, pass the nuts through a strainer to weed out any coarse bits (eliminating the cheesecloth or use of a nut milk bag will allow more solids to pass through to thicken the cream). This makes about 6 cups cream. The strained liquid should have the consistency of heavy cream. Step 5The nut milk or cream will keep for up to five days, covered and refrigerated. The nut milk or cream will naturally separate; simply give it a quick stir or shake to reconstitute before using. In Recipes-list.com we have selected the most viewed recipes from category - Drinks . Enjoy the best recipes specially selected for you! 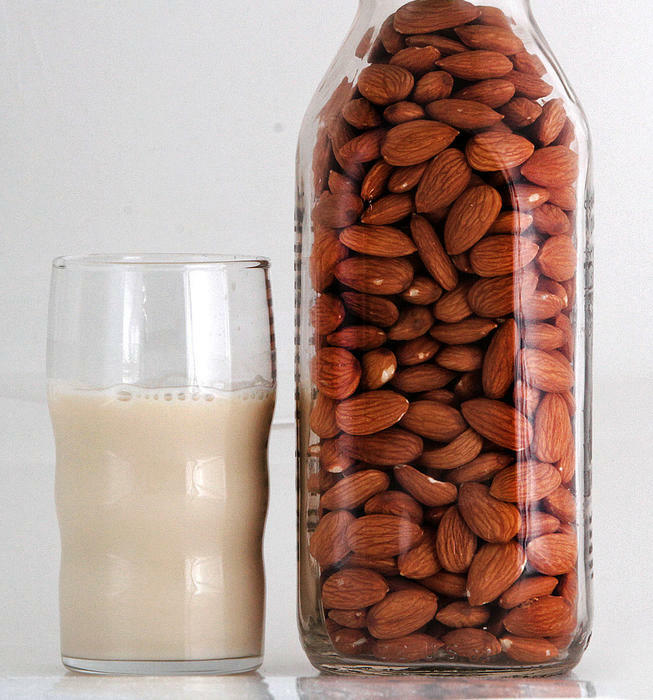 Basic nut milk and cream is the right choice that will satisfy all your claims.